Amon Tobin live dj set at Club A38, Budapest, Hungary on 17 April 2007. Recorded backstage just before the Fluc Wien gig. This mix includes some tracks from the forthcoming album The Foley Room (release date: March 2007). Amon Tobin composed the music for the Hungarian movie Taxidermia. He is credited ("Original Music by Amon Tobin") by IMDB. Three movie clips are available. 2002 recorded somewhere in the USA and used by Ninja Tune as promotional copy. 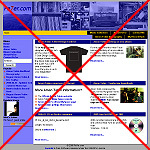 After 1,5 years it was time to restyle the pe7er.com website. You are currently looking at the new style.